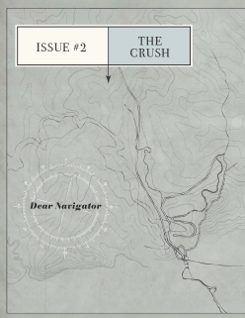 Just published in Dear Navigator 1:2/3 is a new poetry generator, Sea and Spar Between, by Nick Montfort and Stephanie Strickland. This has been a major project of mine and Stephanie’s over the past year. We started seriously working on this project on December 15, 2009, when we met for the first of a few days in New York to discuss and start developing it. 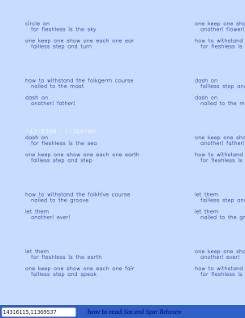 I thought it might take only a few days to complete – not a completely outrageous idea, since I have been working on tiny poetry generators such as “The Two” those in the ppg256 series, which were not time-consuming to produce. As you might guess, since it was just published today (on December 16, 2010), I was wrong about the time it would take. But, I am delighted that the project is appearing now in wonderful company in Dear Navigator, a beautiful and appropriately-named journal. If memory serves, Stephanie and I met at Digital Arts and Culture ’99 in Atlanta. I remember the conversation we had about innovative literature soon afterwards at Limbo, a long-gone coffeehouse on Avenue A in New York. Stephanie offered her advice as I was putting together my application to the Boston University poetry program – one way in which she’s long been a mentor as well as a friend. We’ve served the Electronic Literature Organization together; I had the chance to collaborate with her in editing the Electronic Literature Collection, volume 1; and I’ve gotten to read with her and present in the same session at conferences many times over the years. Sea and Spar Between, though, is our first collaboration as poets. We have a short statement about the project on the “How to Read Sea and Spar Between“ page; the text also appears on the page of Dear Navigator that introduces and links to the piece. I won’t quote from that page here, but I’ll mention that the generator produces a navigable space of stanzas and draws on the vocabulary of and our readings of Dickinson and Melville. Speaking of that code, as you can see for yourself in the file seaspar.js, Sea and Spar Between is licensed under a free software license. As the license says, anyone may copy it, modify it, or make use of it in some other way in creating another project. I hope the project proves pleasing to interact with and read from on the Web and pleasing for those who wish to turn to the code. In the two weeks since it’s been published, Sea and Spar Between has been in Silliman’s blog (with an excellent illustration), Harriet (the Poetry Foundation’s blog), Netartery, and The Huffington Post, and it looks like people are Twitching about it and that there’s some buzz in the Facesphere. If I’ve got that last part right.